Case of a 17 year old female who suffered from severe lumbalgia and radiculopathy into the left leg. The purpose of this clinical case was to determine the effects of NIR laser therapy on pain associated with disc herniation. The source used was a Multiwave Locked System (MLS®) MLS Laser. This paper presents the case of a 17 year old female who suffered from severe lumbalgia and radiculopathy into the left leg. The purpose of this clinical case was to determine the effects of NIR laser therapy on pain associated with disc herniation. The source used was a Multiwave Locked System (MLS®) Laser. The instrument consisted of two assembled laser diodes with synchronized emissions at 808 and 905 nm, respectively. The technique utilized to apply the laser radiation was the global approach using both the ultrahead and handpiece to deliver the treatment. Laser application was initially performed three times per week for the first course of treatment and decreased in frequency for the remainder of care according to the patient’s reduction in subjective findings. The patient’s progress was measured by the Visual Analogue Scale (VAS). A percentage improvement scale was also utilized to determine the percent improvement in pain and range of motion. The results showed steady improvement of pain relief during the seven month course of treatment. At nine months the pain was not present. The results indicate that MLS® laser therapy has beneficial effects on pain associated with disc herniation. Low back pain can occur from many sources. Differentiating lumbalgia due to disc herniation is best done with radiological imaging, specifically magnetic resonance imaging (MRI) . The associated pain can manifest in the area of injury or become radiating in nature, traveling down the pathway of the affected nerve roots [2, 3]. Orthopedic testing including Valsalva’s, straight leg raiser (SLR), range of motion (ROM) and other tests can help with a positive differential diagnosis of pain associated with disc herniation . The purpose of the investigation was to determine if laser therapy administered by a dual wavelength NIR laser (M6-MLS® laser) could be an effective treatment on a 17 year old female patient who suffered from severe lumbalgia and radiculopathy associated with a L4-L5 disc herniation. A 17 year old female patient presented to Orland Park Laser Therapy Center with a chief complaint of severe lumbalgia with associated radiculapathy into the left buttock, left posterior thigh and lower leg to the ankle. Pertinent history of the case included a high speed rear end collision one year prior in which the patient was a passenger in the rear seat of the vehicle. There was no pain in the lower back post motor vehicle accident. Sharp shooting pain L4-L5 bilateral with radiculopathy into the left buttock, left posterior thigh and lower leg. The pain was 6 months in duration from the first appointment and was getting progressively worse. The pain was rated at a 10+ on the VAS scale. The pain was constant and resulted in marked impairment. The pain affected sleep, all daily activities and the ability to sit for more than three minutes without severe pain. The patient missed fifty percent of school days two months prior to seeking treatment. Severe pain in lower lumbar area and down left leg on flexion, extension, lateral bending and right rotation. Decrease in all ranges of motion of lumbar area due to pain and muscle spasm. Positive orthopedic tests included Adam’s, Kemp’s, Valsalva’s, Soto hall and Braggard’s. A decrease in L4-L5 dermatomal sensation was noted with pinwheel testing. Weakness was noted on left leg extension and flexion during muscle testing. Surface electromyography (SEMG) testing revealed severe bilateral paraspinal muscle spasm at the L1 thru S1 level. MRI without contrast revealed L4-L5 disc herniation in the left paracentral region affecting multiple nerve roots. A central disc herniation was noted at the L5-S1 level with no nerve root involvement. Initial diagnosis was lumbar disc herniation with associated lumbar segmental dysfunction, lumbalgia and radiculopathy. Prior treatment included local injections of Tosdal, Tylenol, prescription anti-inflammatories and prescription pain medications with no pain relief. Physical therapy utilizing low back exercises and treadmill therapy intensified the pain. Discussions with Orthopedic surgeon and pain specialists included steroid injections, Celebrex and surgery. This is when the patient decided to seek care at Orland Park Laser Therapy Clinic. The initial treatment plan consisted of laser therapy utilizing a dual wavelength NIR laser ( M6 MLS® laser, ASA srl, Arcugnano, Vicenza, Italy). The treatment was initially applied 3 times per week for 4 weeks. Application of the treatment was done using the global approach, which consisted of the following parameters and mode: 2000Hz at 100% intensity for 10 minutes, using the ultrahead directly over the L2 thru S1 lumbar spine and paraspinal area. The handpiece was used over the L4-L5 area at 4 points, 1 minute each, with 2000Hz and 100% intensity. Following the initial 4 weeks of treatment with the M6-MLS laser low back stability exercises were added to begin an exercise rehabilitation program. Flexion-distraction technique utilizing the Cox flexion-distraction method was also added to treatment to aid in the resorbtion of disc material and increase the pliability of the lower back soft tissue . 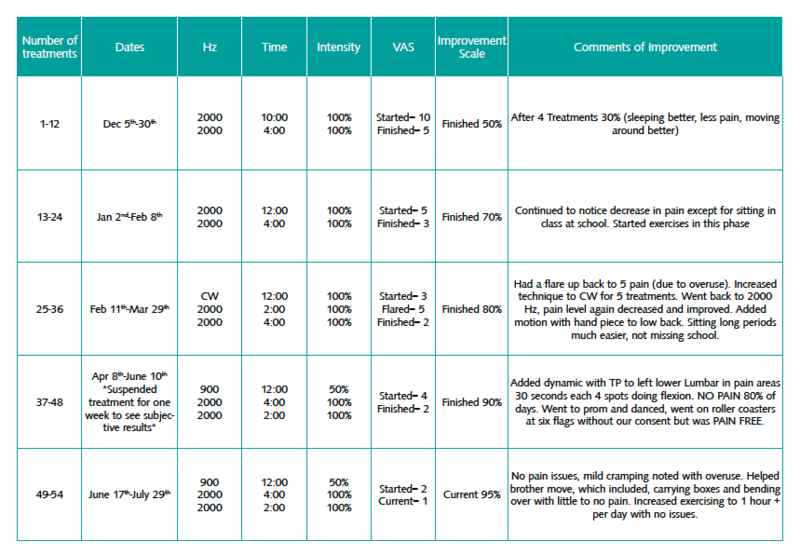 Table I shows the continuation of care over a 7 month period utilizing the MLS laser. Note that after the 24th treatment motion was added to the treatment utilizing the handpiece to trace the sciatic nerve in the left leg. The patient went from a pain level of 10 on the VAS scale on initial evaluation to a pain level of 1 over the 7 month period of treatment. ROM study revealed normal ranges of motion post treatment with no pain associated on any ranges. All orthopedic, dermatomal and muscle tests, including SEMG testing, were normal on patient’s final evaluation. A 90 day follow-up revealed no pain in the lower back or left leg unless sitting in class for longer than 2 hours without getting up to stretch. Severe lumbalgia with radiculapathy caused by disc herniation is usually progressive in nature and can lead to many debilitating limitations including the inability to exercise which can accelerate further degenerative changes leading to increased pain, weight gain and other problems . In this case study, the patient had total remission of pain in the lumbar and left leg areas. Initially the only treatment administered to the patient was M6-MLS® laser which showed a 50% decrease in pain over 4 weeks. At this point exercise was added which allowed the patient to lose 50 lbs. over the course of her treatment possibly contributing to her final results. Other possible contributing factors include Cox flexion-distraction technique and rehabilitative exercises. In this case study, the M6-MLS® laser proved to be effective in decreasing the amount of pain associated with nerve root irritation caused by disc herniation. In addition to the analgesic effect, MLS® therapy may also have long term effects on this condition related to its ability to increase microcirculation and lymphatic drainage causing a decrease in chronic inflammation  and edema  associated with chronic symptoms of prior injuries. Furthermore, effects on cell energy metabolism leading to increased ATP production [9,10] and efficient ATP utilization , may aid in the body’s natural ability to heal. Another advantage of the M6-MLS® laser is no side effects or heat generated during treatment, making it a more pleasant experience for the patient therefore increasing patient compliance. Frymoyer JW. Back pain and sciatica. N Engl J Med, 1988, 318(5): 291-300. Argoff CE, Wheeler AH. Spinal and Radicular Pain Disorders. Neurol Clin, 1998, 16: 833-849. Miller KJ. Physical assessment of lower extremity radiculopathy and sciatica. J Chiropr Med, 2007, 6: 75-82. Mansion AM. Chiropractic management using Cox cervical flexion-distraction technique for a disk herniation with left foraminal narrowing in a 64-year-old man. J Chiropr Med, 2011, 10(4): 316-321. Hegedus B, Viharos L, Gervain M, Gàlfi M. The effect of low-level laser in knee osteoarthritis: a double-blind randomized, placebo-controlled trial. Photomed Laser Surg., 2009 27(4):577-84. Radwan DA, Mohammed NH, Zaky AA. Effectiveness of low power laser therapy and betamethasone in minimizing postoperative edema and trismus after third molar surgery: a clinical trial. Journal of American Science, 2010 6(12) 986-989. Oron U, Ilic S, De Taboada L, Streeter J. Ga-As (808 nm) laser irradiation enhances ATP production in human neuronal cells in culture. Photomed Laser Surg. 2007 Jun;25(3):180-2. Kujawa J, Zavodnik L, Zavodnik I, Buko V, Lapshyna A, Bryszewska M. Effect of low-intensity (3.75-25 J/cm2) near-infrared (810 nm) laser radiation on red blood cell ATPase activities and membrane structure. J Clin Laser Med Surg. 2004 Apr;22(2):111-7. Monici M, Cialdai F, Ranaldi F, Paoli P, Boscaro F, Moneti G, Caselli A. Effect of IR laser on myoblasts: a proteomic study. Mol Biosyst. 2013 Jun;9(6):1147-61. doi: 10.1039/c2mb25398d. Interested in the Science behind Laser Therapy?